She walked up and placed her warm hands in my own. I noticed her smile right away. Her dimples cratered out, one deeper than the other. My voice cracked and tears filled my eyes as I asked her how I could pray for her. I bowed my head, God give me words. I think I prayed for twenty women at that maximum security prison event in Topeka Friday night. Each one came to me with eyes full of tears, hearts so tender and broken. By the tenth woman, I had a hard time keeping it together. So much pain in one room. Please God, my heart cried, hear their prayers. Heal their hearts, rescue their children, bring hope and life where there is only despair and death. My prayers seemed too small for the bigness of the hurt. A drop of grace in a bucket of sorrow. The woman with the broken dimple stiffened her wrist as I held her hands. She turned one to the side and I glanced down. A long jagged scar marked the inside of her arm. Scars on the outside, scars on the inside. I sit with tears in my eyes as I write this blog. I’m feeling a bit like all I did was place a tiny band-aid on their gaping wounds. I feel the weight of their hurt and know that there are thousands and thousands just like them all around this country, all around this world. God, use those of us who are able, to scoop up the wounded and hurting. Show us how to love with all of our hearts. Maybe if we each extend a drop of grace, their buckets will fill to overflowing. Maybe if we each apply a tiny band-aid, we can bind up their wounds. Maybe if we each carry one soul into God’s throne room, He can wrap his arms around them there… and turn their broken dimples into joy. Oh Lord, may it be so. I jumped up and down in my living room yesterday. I screamed at the TV. I clapped and hollered and nearly chest bumped my husband in my exuberance. I never get that excited about NFL football. I occasionally watch college football, but only because my man loves Ohio State and I love my man. So what made me go wild during the Broncos game? I heard a woman talking on the radio today. She said that while she was happily married, she is so taken by Tim Tebow that when she saw him in a store the other day, she stalked him all through the aisles. I wouldn’t go that far. I like Tim, but my husband is the only one I’ll ever stalk. I think I like Tim Tebow for the same reason I liked that guy on X-Factor who was doing his best to stay clean for his little boy. Tim seems to be the real deal—at least, I want him to be the real deal—a guy who walks the walk as he talks the talk. Maybe I’m just hungry for a hero, for a public figure who loves Jesus and lives it out in his every day life. Maybe a lot of us are hungry for that. That spark, that energy, it’s totally Jesus—and I’d bet a gazillion dollars Tim would say the same thing. Some people are quick to call any football star a hero. And while I think it’s awesome that someone can take a hit or catch a spiraling ball while being run down by massive muscle bound guys, I don’t think that necessarily qualifies for hero status. But I think standing for faith is heroic. I think being kind and generous and hard-working (in the midst of harsh scrutiny) is heroic. I think being aware of his role-model status and humbly reaching out to others – is heroic. So I find myself cheering for Tim. I cheer for him during the game, but I also cheer for his life off the field. I long for him to make it, to be one to stand for the long haul. To be the guy who inspires teenagers to be unabashed in their love for Jesus too. To be the man who stays pure and marries the woman of his dreams and has little baby Tims who will love Jesus too. But you know what God seemed to whisper to my heart as I watched Tim and cheered his football while cheering his faith? I felt like He reminded me that while it’s great to pray for Tim Tebow and to cheer on his heart for God, I have the same opportunity as Tim. Oh, not to run down a field or throw a spiral or barrel over burly men to score a touchdown (as totally fun as that would be), but I certainly have an opportunity to live my faith every day. To be one to stand strong. To live it out. To walk the walk, talk the talk, dance the dance. To be the real deal. We all have the opportunity. People are watching, people are cheering, people long for a hero – to see someone authentic and true. I got to hold a baby human yesterday. Ten little fingers, ten little toes. I was the first grown-up (other than Mom, Dad and nurses) to hold him. 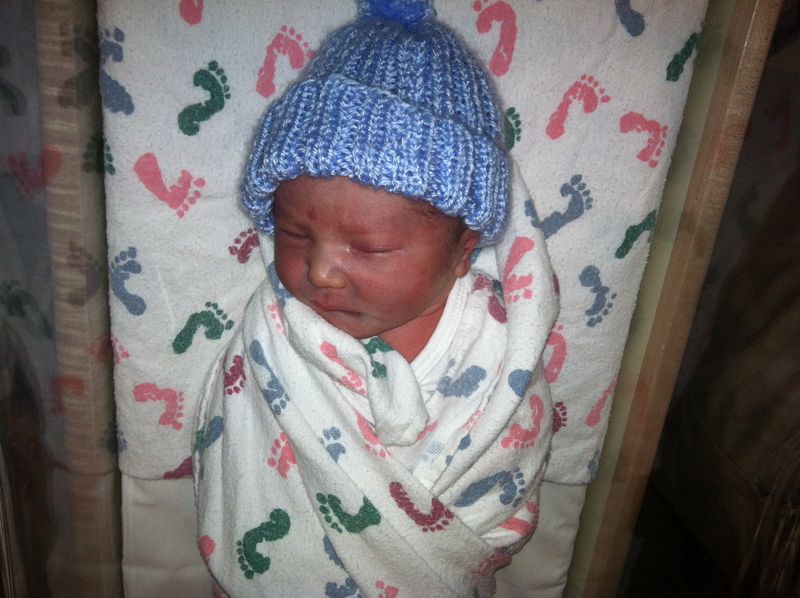 He was only 2.5 hours old. And he didn’t even cry. I fell in love with Raccoon yesterday. Such a miracle! I stared at his baby face and wondered about all the potential inside of him. I imagined seeds of strength and wisdom, creativity and play, humor and passion. I don’t know how old you are today, but once upon a time, you were a baby human. There’s a good chance that people held you in their arms and with tears in their eyes, wondered at the miracle of your birth. They kissed your little nose and found you absolutely perfect. And then there was your God. Even if your birth circumstances were tough, He was right there. He marveled at your form and patted himself on the back for how good you came out. I did a fine job with that one, He thought to himself, I get better at this every year. And inside of you were those seeds—seeds He planted himself. Created by design to live for a purpose. All that hope lies inside you, you know. Seeds of strength, beauty, talent, wisdom, courage, passion, humor, creativity. I remind myself of the same thing. And I remember that I need to keep pulling weeds to get about the business of sprouting. Care to join me, fellow human? For you created my inmost being; you knit me together in my mother’s womb (Psalm 139:13). 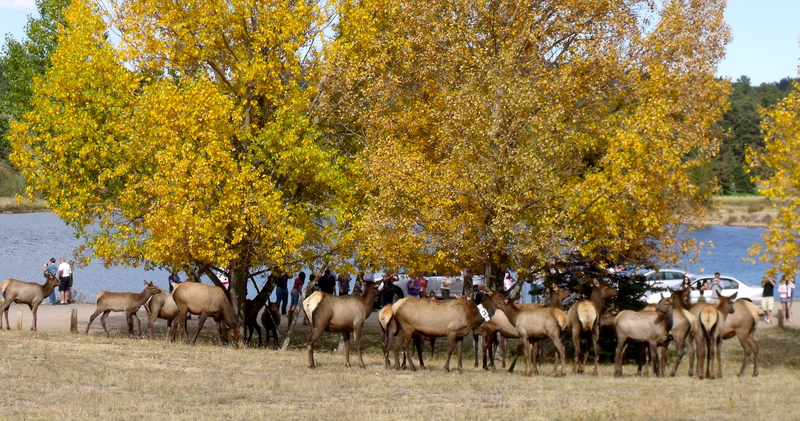 It all unfolded when we went to Estes Park to see some elk bugling. I’d never heard of it before, but apparently when the bulls try to woo their women, they bugle. I’m thinking the most impressive bugler gets the girls. Makes sense to me. If Brian had asked me out with a little ditty on a trumpet, I would have answered even faster than the whopping three seconds it took me to say yes. 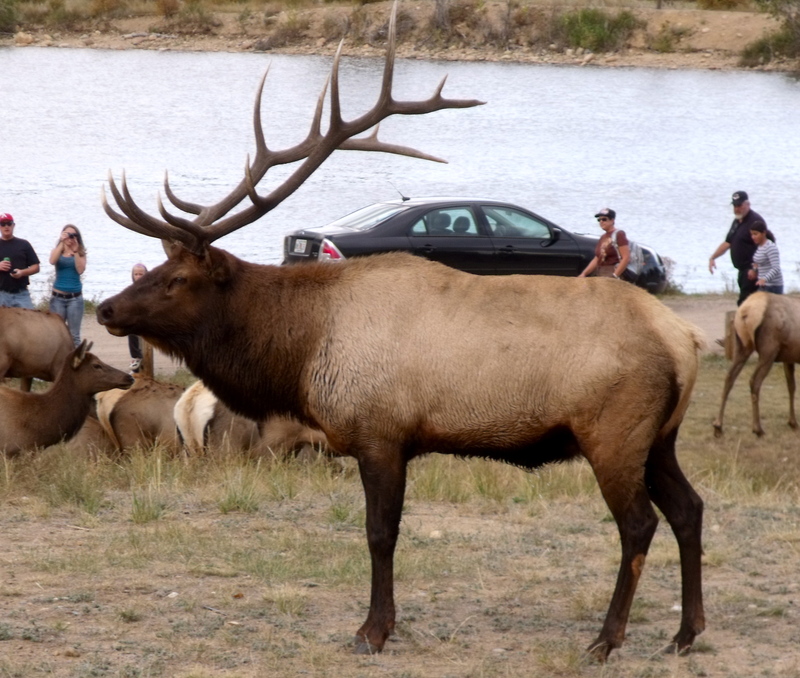 So we showed up in Estes Park to find that the elk were literally right there in town, gathered around one of the parks. We quickly pulled over with the zillion other tourists and grabbed our cameras. People were getting pretty close to one of the bulls, so we did too, snapping some great shots. Then there was some commotion. Here’s a slice of the action Sam caught on film. You won’t see mom in the shot because she ran out of the way… She’s smart AND fast. Luckily, Mom was safe and sound and NOT run over. Just because elk bugle, doesn’t mean they’re the happy sort. Never get between a guy and his dame. If you’re trying to convince your mother to move to Colorado, don’t let her get run down by a large grumpy animal—with horns. And a final thought: Today is my birthday. I turn 43 years old. My mom is 75. The very fact that she tangled with a bull and survived, that she climbs around the mountains with us – well, it’s inspiring. And you know what else? She recently bought a Mac after being a PC girl her whole adult life. She’s learning a new operating system and just made her first DVD of pics and music. While I’m going backwards and prefer Velcro to tying my own shoes, she is forging ahead into new territories. So here on my 43rd birthday, I’m committing to live like my mama and become a bull-elk tackler, budding computer guru, and live-life-to-the-fullest-continental-divide-conqueror. But first I have to remember how to tie my shoes.